Our patio is my little oasis! I know how rare outdoor living space is in a city so I don't take this area for granted! When we looked at apartments back in 2015, we hoped to move into our current complex. The complex has three huge buildings in it but there is only one floor with enclosed patios like ours. While there are a lot of units with balconies, we knew that it wouldn't be the same if we couldn't have enough space to put a couch. Comfort=coziness, right!? Needless to say, once we found out about this unit, we ran! It blew the others that we saw out of the water because it felt so peaceful. We were also drawn to the fact that we could entertain out here. I love to plant flowers out here (and by plant I mean have Jay and my mom kindly do the labor for me) even though the shade and shallow dirt make it challenging. Being able to pick flowers from your little garden to put in vases in your home is one of those simple pleasures that really get me! I love having the sliding patio doors because it allows us to see directly onto our patio and open the screen door to enjoy the fresh air. It gives the illusion that our apartment is bigger than it is since the patio starts right where our living room ends. It also means that we have a peaceful view for an apartment in a city. Our patio is gated within a communal courtyard that has trees and flowers and open green space. I love getting to look out at the greenery and feel like I have my own version of a backyard. In the winter, the snow remains untouched and preserved so we get to pretend like all of winter is magical from our view. Our courtyard setup also means that it is so quiet in our apartment. We rarelyyyyy hear any noise and if we hear anything, it's kids laughing in the courtyard. I feel like we are so spoiled that we never hear any horns are cars or anything and I don't know how we will ever give that up. We spend as much time as possible out there! We have an electric heater that I call the incubator. We sit under that and use big fluffy blankets in the fall and spring. Don't worry, I obviously have separate indoor and outdoor blankets...let's be real. We keep an old TV under our bed and we bring it outside with our Apple TV and watch shows and movies outside sometimes. We set up our Beat's pill speaker and put the speaker close to where we are sitting so that we project as little noise as possible. Ordering pizza and binging on Netflix out there is my idea of a great night! I am so grateful for this space and all of the memories that we regularly in it! I linked the sources for everything that you see here below. The only things that I could not link are the table and chairs because they are a super old set that my mom spray painted for me. 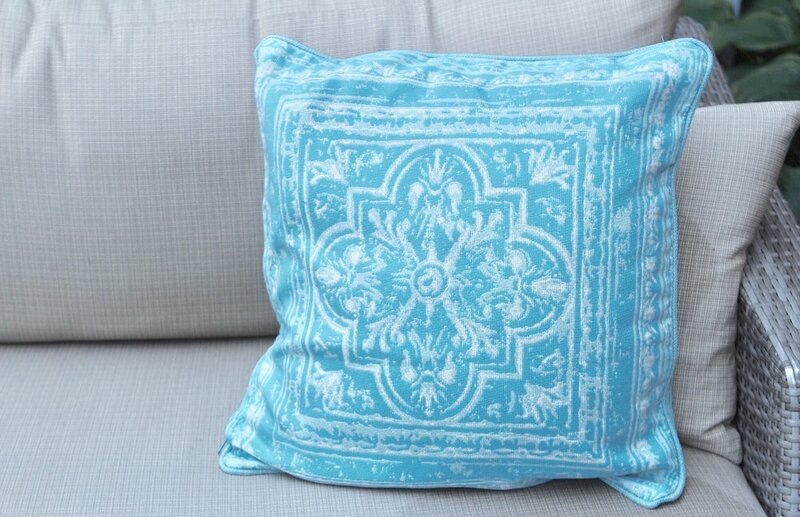 Our thrown pillows are also discontinued. As always, please don't hesitate to ask me any questions via email or comment!